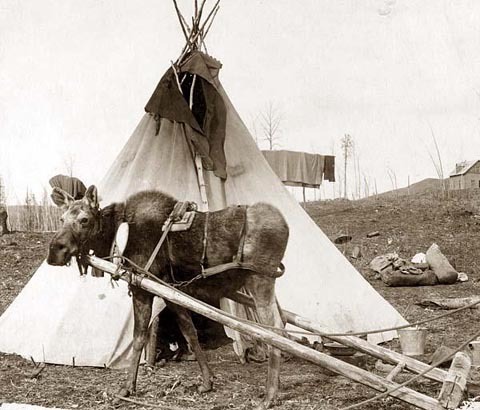 TYWKIWDBI ("Tai-Wiki-Widbee"): Can a moose be used as a "beast of burden" ?? Can a moose be used as a "beast of burden" ?? I saw the photo above at Uncertain Times and began to wonder. One's knee-jerk reaction is, of course, to assume that every odd photo is 'shopped, but reindeer have been semi-domesticated for centuries. Could you train a moose to pull loads, if you started at an early age? 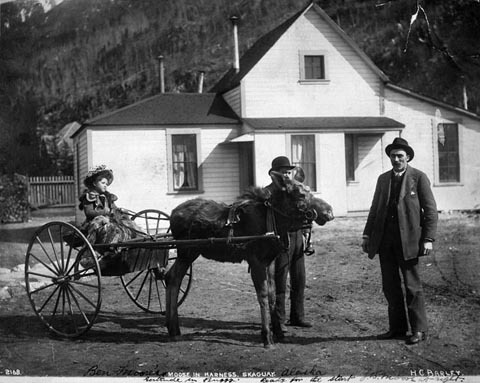 - showing "a pair of moose, hand-raised by owner Peachy Prouden. The photo was taken at Athabasca Landing, Alberta in 1898." - where there is also a photo of a moose with a saddle on it. So, now that we're convinced that a "working moose" is possible, what about the original photo? It is Photoshopped, as explained at this "urban legends" site, where note is made of "Chevaux d'Abitibi" ("Horses of Abitibi") on the man's jacket and the mirror-image woodpiles on the left and right covering some other item(s) in the original photo. And, if you've read this far and are still paying attention, you might move on to this Google Books link that explains why a moose's long legs give it an advantage in fleeing from wolves on irregular terrain (and other quite interesting biologic tidbits). 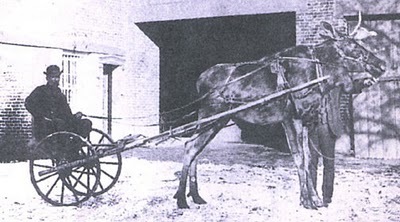 The moose was named "February," and the photo was taken in New Jersey in 1886; details at the link. 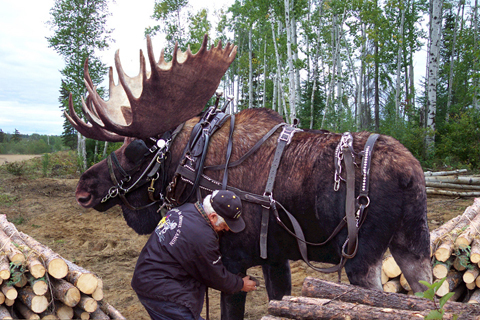 I pegged the top picture as Photoshopped because the harness is sitting too precisely on top of the moose's coat. And the bit isn't anywhere near the mouth. A word of warning: you can get lost for days in their archives. I remember finding an article given to me a long time ago, by someone who found a picture I drew of a reindeer in saddle and bridle. I was unaware that other animals could be harnessed aside from horses, oxen, donkey, reindeer, and mules, etc. There are instances of people trying to ride elk, but however, most deer and animals like llamas and alpacha are unsuitable for riding mainly because their backs are more flexible than a horse's and would cause great discomfort to a rider (in fact as a tutorial for depicting people riding animals such as wolves and tigers, an artist had to point out wolves and cats alike have very flexible backs, look at a cheetah for such comparison). Plus the way an animal walks also determines the comfortability of riding on one (such as in the case of Paso Fino horse; they're the cadillac of horses). I haven't notice how a moose moves it's legs, but if it's similar to a camel's, then it would be a very bumpy ride, noting that most if not all of the pictures above are of moose harnessed to pull wagons and such, rather than riding. I've received that particular photo as an email before. I am looking for it now. Stonemaven, tx for the moose dairy link; it's better than the one other that I encountered. Neat-o! I found this on youtube, pretty crazy! Years back, I posted the same photo on my blog! 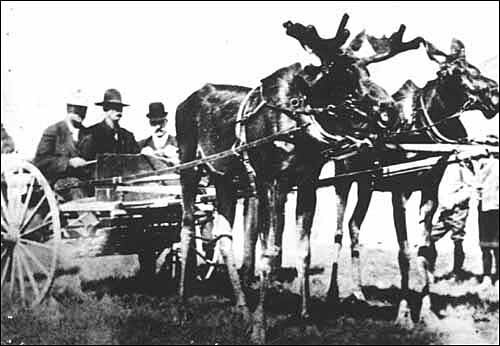 I also had several other posts about moose as we had one here locally in the late 1880's trained to pull a cart, called "February". He was reported to have paraded his owner through Mt. Holly, NJ, the county seat, on a most memorable political campaign. Also here is an old photo of a guy riding a moose. I love your blog. It is all over the place and always makes me think! Thank-you! Thanks, Sandy. I've added your info (with a link) to the post. Referring to, "I saw the photo above at Uncertain Times and began to wonder. One's knee-jerk reaction is, of course, to assume that every odd photo is 'shopped,"
Yes, it has been "shopped". The stack of wood on the right is a pasted reverse image of the stack of wood on the left. Yes I see what you are talking about the wood stack. Good call. 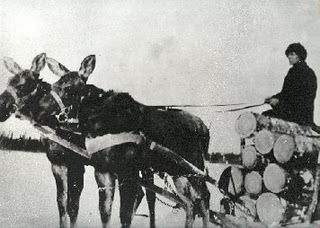 Bottom line is that the Russians actually had a program in trying to domesticate moose as beast of burden prior to WW2. The best of their efforts assessed that only 1 in every 1,000 had the ability to be domesticated so the program was dropped.